People’s Artist of Russia Denis Matsuev needs no introduction. RBTH correspondent met with Matsuev right after his concert at the Berliner Philharmonie, where he played Shostakovich’s Piano Concerto No. 2 with an orchestra conducted by Valery Gergiev. While studying at the Central Music School at the Moscow Conservatory, Denis Matsuev became a laureate of the New Names Foundation and played at concerts in over 40 countries. The International Tchaikovsky Competition winner has a list of accomplishments so long that one could not possibly know where to begin. RBTH correspondent Dmitry Dragilev met with Matsuev after his concert at the Berliner Philharmonie, where he played Shostakovich’s Piano Concerto No. 2 with an orchestra conducted by Valery Gergiev. Russia Beyond the Headlines: Was your choice of Shostakovich determined by your personal attachment to such energetic themes, to such drive, or by something else? Denis Matsuev: I adore Dmitry Shostakovich’s concertos, both absolutely brilliant masterpieces that he created for the piano. The second movements of both concertos are simply hits for any time: the deep, beautiful, romantic melodies; such a bright contrast between the first and third movements. And the first concerto, as Yuri Temirkanov put it (and I completely agree with him), is just the greatest hoot! RBTH: Who do you see as your teachers? I don’t mean those who actually instructed you, but rather your predecessors. Somehow, when I listen to you now, I recall Emil Gilels. D.M. : Yes, I will always worship him. One time I even parodied him, imitated his manner of playing, his fantastic sound: It immediately sounded just like how only he plays. But Emil Grigoryevich is, of course, only one of my teachers, along with Sviatoslav Richter, Arturo Michelangeli, Vladimir Horowitz, Van Cliburn — though first and foremost is Sergei Rachmaninoff. RBTH: Is working with Gergiev easy? D.M. : Oh, yes, he is my closest friend among musicians. We have been friends for many years. By and large, this has brought us a great deal of happiness, because Gergiev is a man who really works his fingers to the bone. And his favorite word is “plow” (in Russian "to plow" can be used as a synonym for "working particularly hard"). It was not for nothing that he was awarded the title “Hero of Labor of the Russian Federation.” This man really is a champion of his work. He will fervently take up anything and follow through with it, be it a phenomenal interpretation or the erection of a new theater. We have been devoting a great deal of time lately to children, to our country’s younger generation. Fortunately, there are plenty of talented children, and we need to help them. My most recent work in this regard was at the White Nights festival, where the winners of the last competition in Astana — where I am was the chairman of the judges — performed. I hope this will be a starting point for a great career for these rising stars. RBTH: Do you spend a lot of time on community service? D.M. : Yes, a good deal of it — but it ultimately brings results. If this were just work for the sake of being on the books somewhere, I never would have started doing it in the first place. I can see that it is bearing fruit: this failure to introduce standards, a law concerning the patronage of the arts, support for our youth, and much else. Classical music should be played in schools. And what Gergiev does with choirs — it’s just remarkable! He is simply revitalizing the choral art in Russia, and that is really worth a great deal. RBTH: What brought you to jazz? D.M. : It’s not quite jazz, but some of my fantasies, or even my tribute to jazz in my own style, since I have been listening to and improvising with jazz since my childhood. My father is a magnificent pianist and composer who plays jazz as well. Improvisation is very important and very helpful, including in classical music. 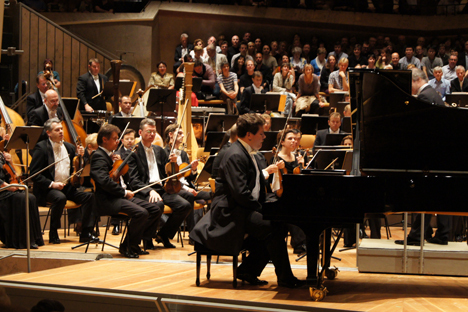 All the more so when you’re playing with Gergiev: And he is a master of improvisation and interpretation. I am deeply convinced that the rehearsal process is a process of chipping away at one another, a process of mutual support, in so far as you feel a person, in so far as you will be able to be flexible with him. When this occurs during a concert, everything falls into place.